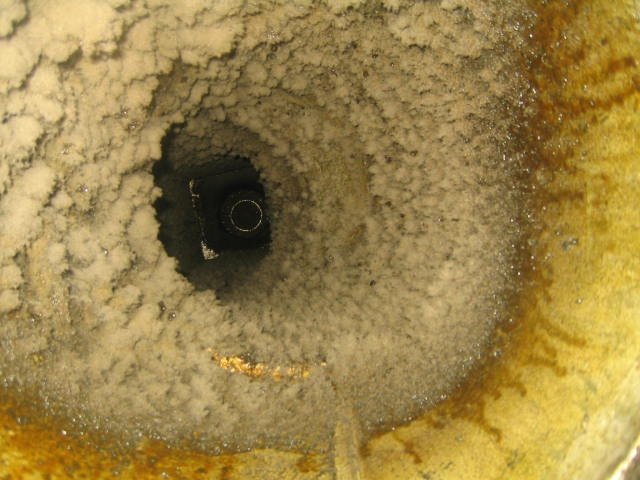 Are you putting off getting your kitchen exhaust system cleaned? 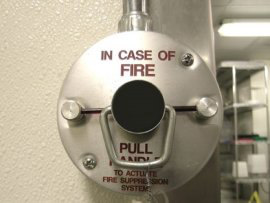 If you wait longer than the NFPA 96 Fire Code recommends, you’ll be doing more harm than good. 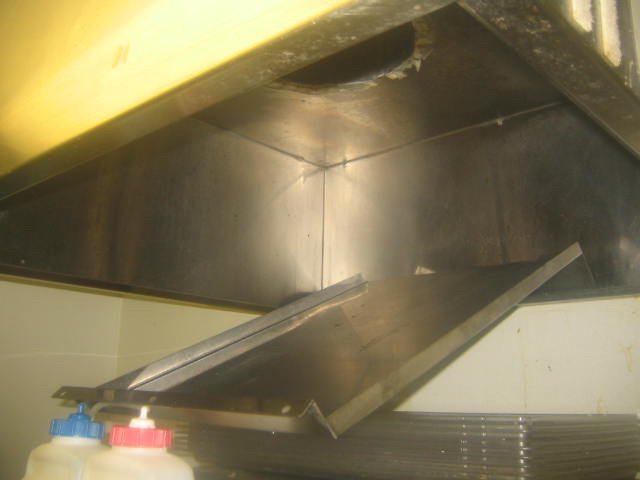 When you get your kitchen exhaust system cleaned regularly, you prevent costly maintenance problems down the road such as poor ventilation, overburdened fan motors, and potential fires that can close your business down for good. Remember: An ounce of prevention is worth a pound of cure! 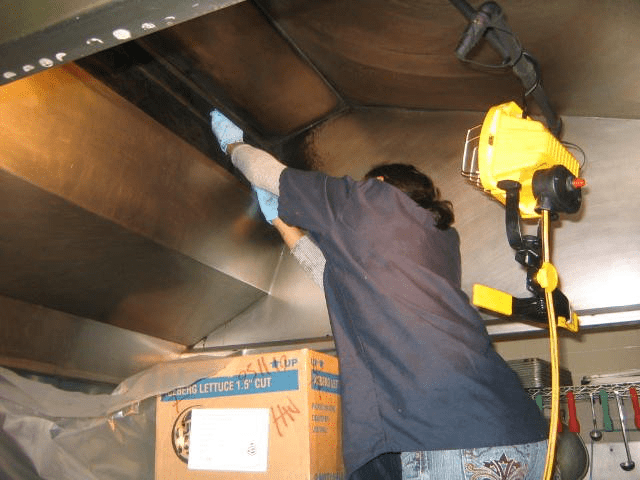 At Silver Lining Hood Cleaners, our goal is to provide the most thorough and complete kitchen exhaust cleaning available, in accordance with NFPA 96 and Portland fire codes, and also in compliance with Oregon Health Authority cleaning requirements. 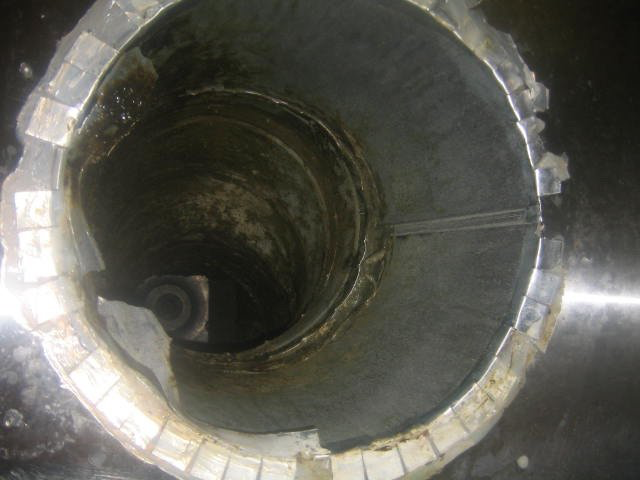 Our technicians are certified, and our company is fully licensed, bonded, and insured. 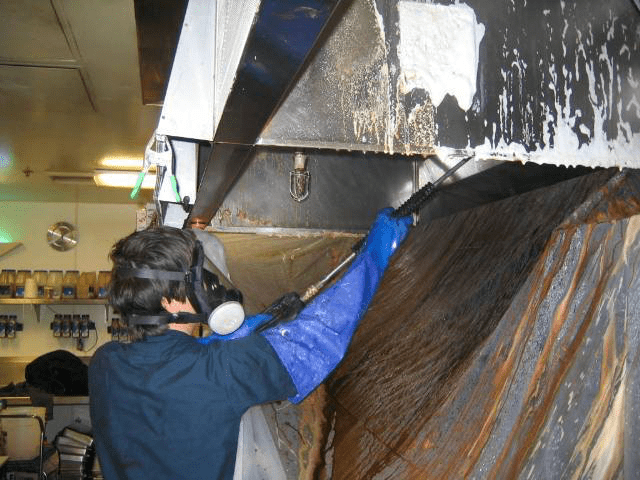 We use an innovative foam chemical application to eat away the grease, which can be rinsed away afterwards with minimal water and minimal mess. 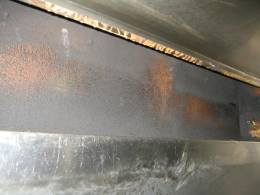 This method allows us to do a more thorough cleaning of your entire exhaust system, even in those tight, hard-to-reach areas. Give us a call or use the button below and we would be happy to answer any questions you have about our services. 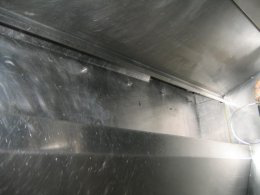 Additionally, we take digital photos of your kitchen exhaust system cleaning so that you can be absolutely sure of the work being done, even in those areas you cannot easily see! 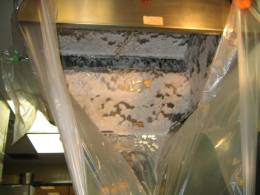 The NFPA 96 Fire Code states that “Grease filters shall be of rigid construction that will not distort or crush under normal operation, handling, and cleaning conditions… and shall be arranged so that all exhaust air passes through the grease filters.” This is because the filters are your first line of defense in keeping grease out of your exhaust system, and more importantly, they serve as a “shield” to prevent flames from entering your exhaust ducts. 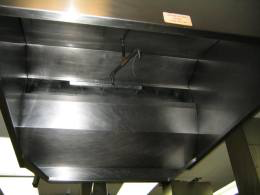 We can replace your broken and/or missing hood filters for you with a stainless steel equivalent. Sizes and styles vary; call for more details. 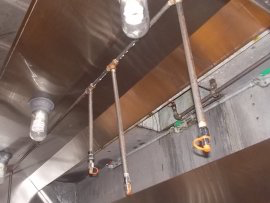 The NFPA 96 Fire Code states that “Grease drip trays shall be pitched to drain into an enclosed metal container having a capacity not exceeding 1 gal.” We can replace your missing drip cups for you to help prevent grease from dripping onto the floors and causing a slip hazard. Sizes and styles vary; call for more details. We can replace your broken/missing hood lights & globes. 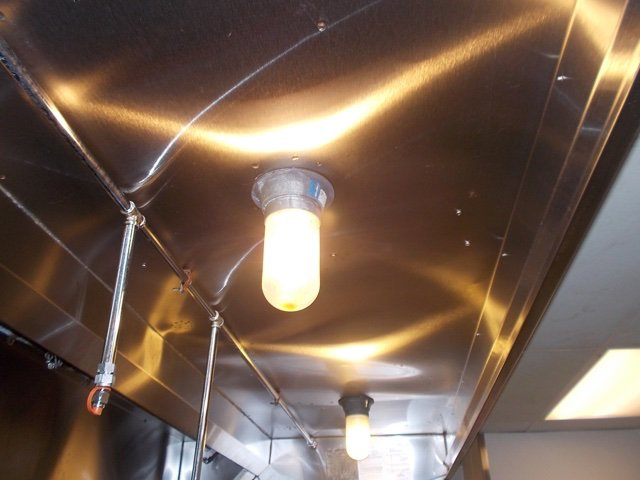 We use a 100-watt rough service bulb to withstand the continual heat and vibrations generated under kitchen exhaust hoods. Globes are important because they prevent accidental damage to the delicate light bulbs inside, keep grease-laden vapors away from the light fixtures, and serve to contain any glass from the light bulbs in the event one should shatter. 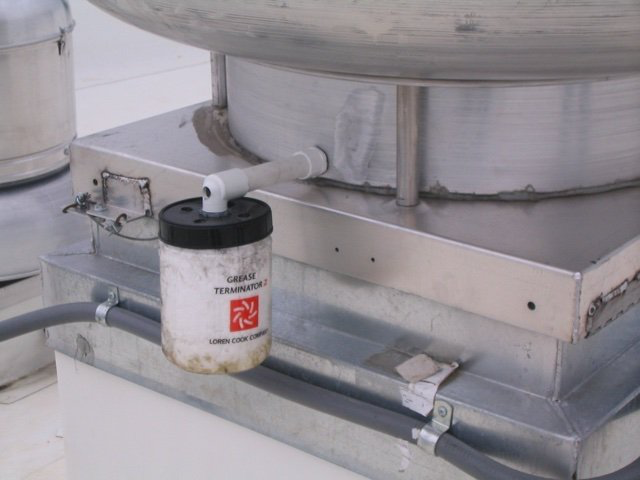 The NFPA 96 Fire Code states that “Fans shall have a drain directed to a readily accessible and visible grease receptacle not to exceed 1 gal.” These grease catch receptacles are necessary in order to collect the excess grease drawn from your exhaust system and help prevent it from getting onto your rooftop. 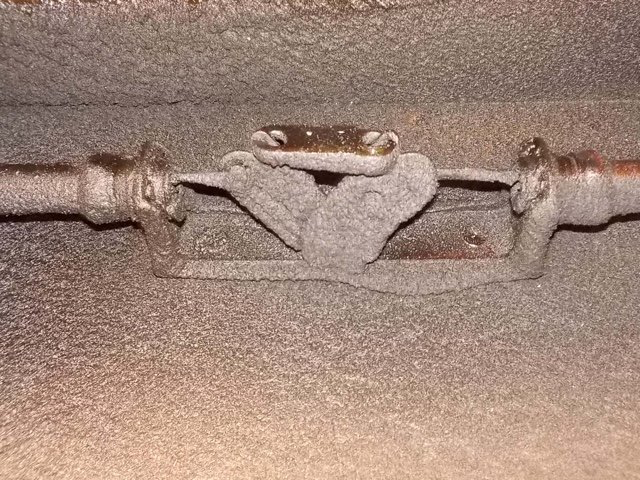 We can install and/or replace your missing grease catch receptacles, and when the pillows become saturated with grease, we can replace these during your regularly scheduled exhaust system cleanings. Sizes and styles vary; click on this link for more details. These filter cartridges collect the excess grease drawn from your exhaust system and help prevent it from getting onto your rooftop. 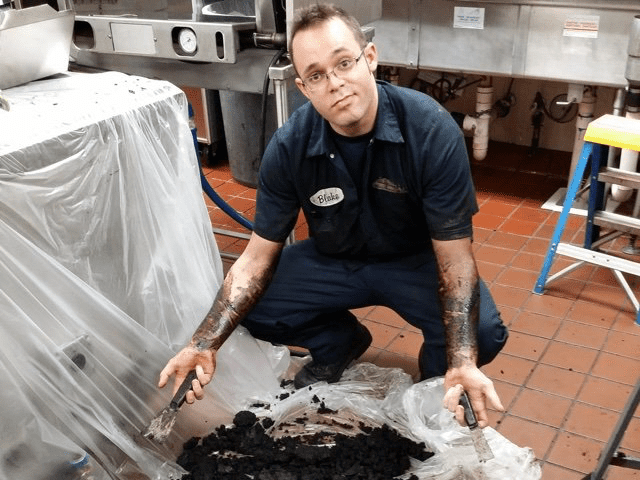 Once they become saturated with grease, these cartridges should be replaced and we can do this for you during your regularly scheduled exhaust system cleanings. 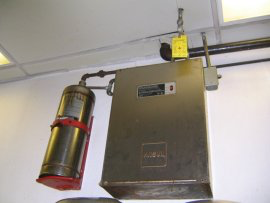 The NFPA 96 Fire Code states that “Cooking equipment shall not be operated while its . 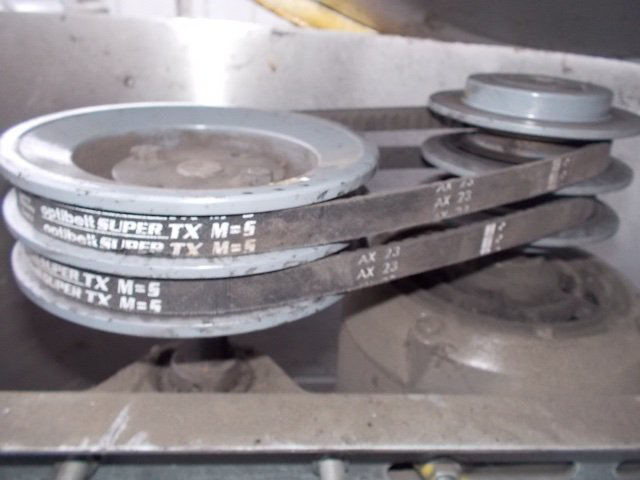 . . exhaust system is nonoperational or impaired.” Since good, working fan belts are an integral part of your exhaust system operation, it’s important to stay on top of fan belt maintenance. 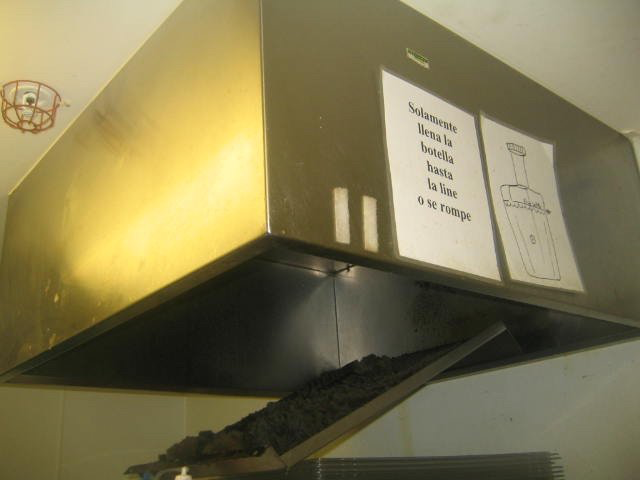 We can check these for you during your regularly scheduled exhaust system cleanings and replace any worn and/or damaged fan belts, before they break and shut down your cooking operations. Sizes and styles vary; call for more details. 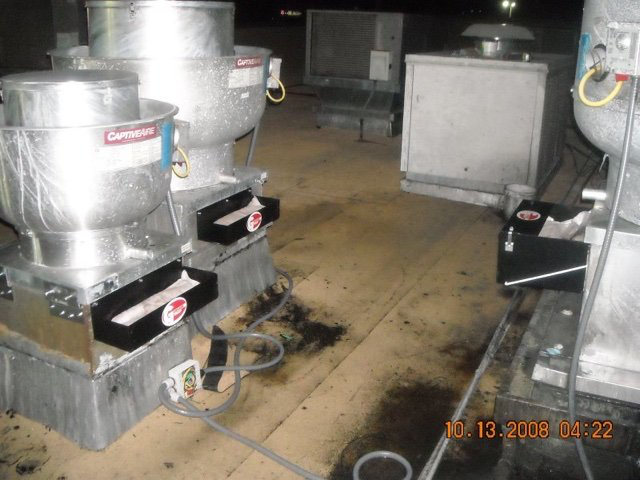 The NFPA 96 Fire Code states that “Upblast fans shall be hinged . 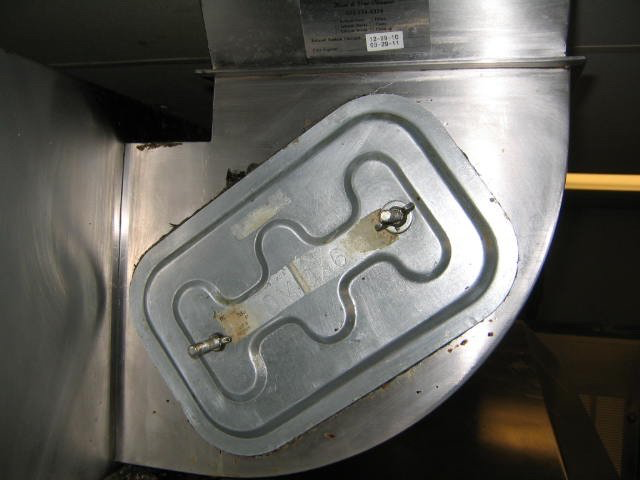 . . and supplied with service hold-open retainers.” These are important because they allow our technicians to safely tip your fans back for cleaning the fan blades inside and the duct below. 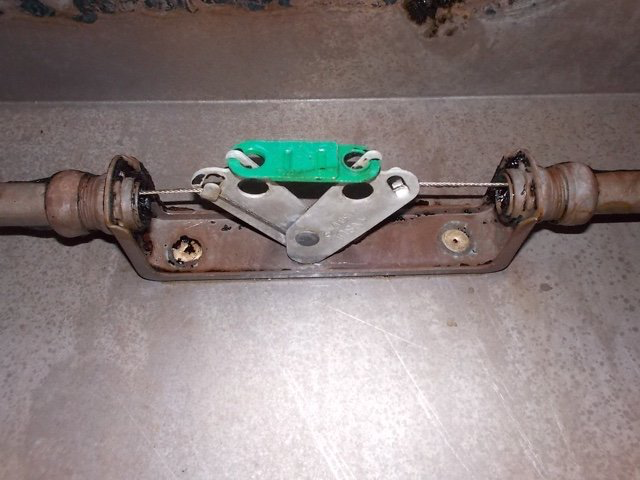 We keep these hinge kits in stock and can install them to bring your exhaust fan(s) up to code. Some fans are so large and heavy that a standard hinge kit will not work to support that much weight. 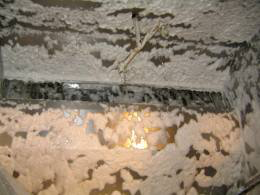 These situations need heavy-duty hinges installed in order to make the fan and duct interiors accessible for cleaning. 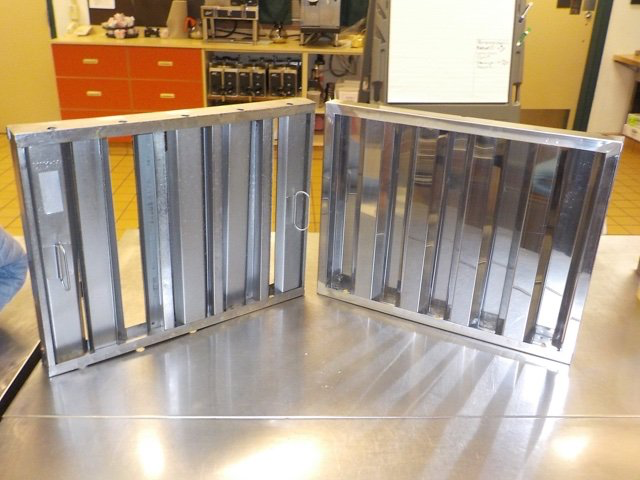 These hinges are a special order item, and we can install them to bring your exhaust fan(s) up to code. 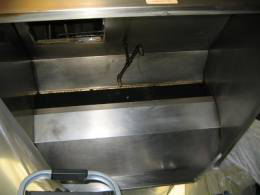 Although dishwasher exhaust systems are not a fire hazard, the interiors do collect dust, dirt, food residue, and other debris that support bacterial contamination. 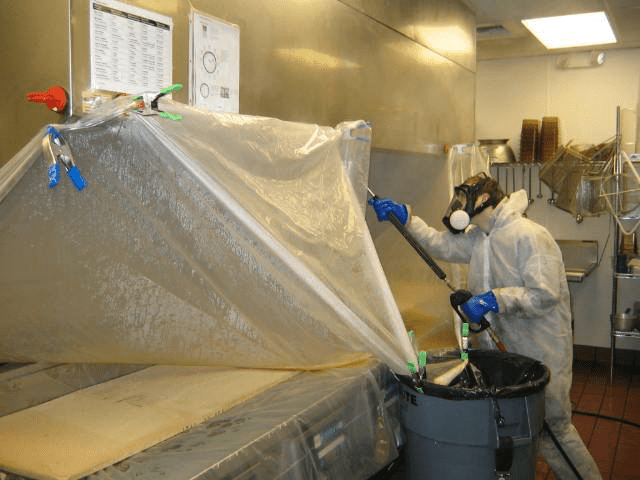 The Oregon Health Authority requires that all nonfood-contact surfaces of kitchen equipment be cleaned at a frequency necessary to preclude accumulation of residues. 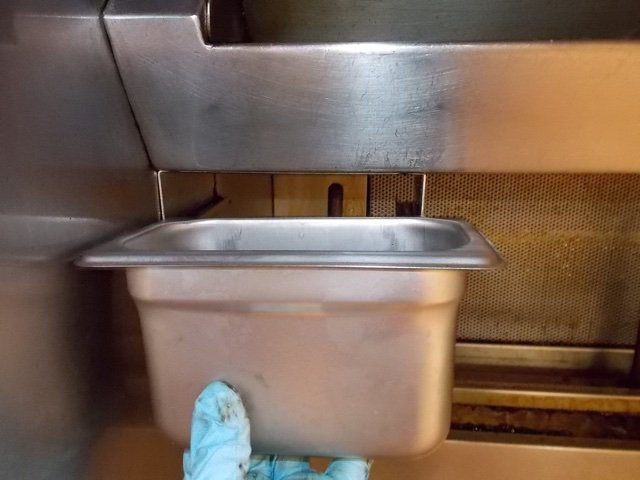 We have found that dishwasher exhausts, when not maintained on an annual cleaning schedule at least, experience quite a surprising amount of buildup and accumulation inside. Check out the ‘before’ and ‘after’ photos below for an example of this by moving the slider back and forth between the two images. 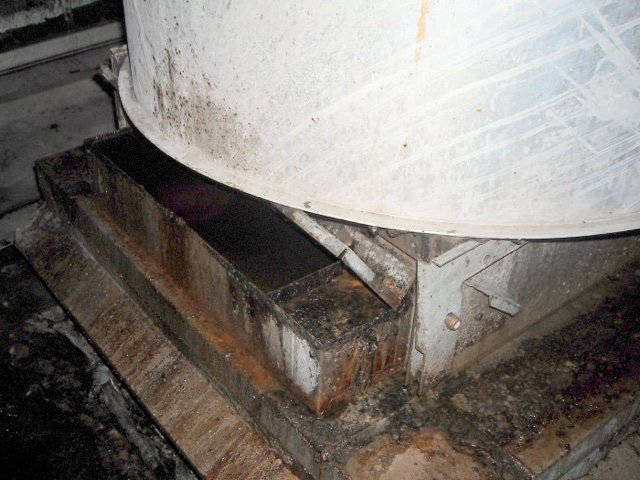 If your exhaust fan is spilling grease out onto your rooftop, then this is a problem that will cause damage to your roof surface over time. 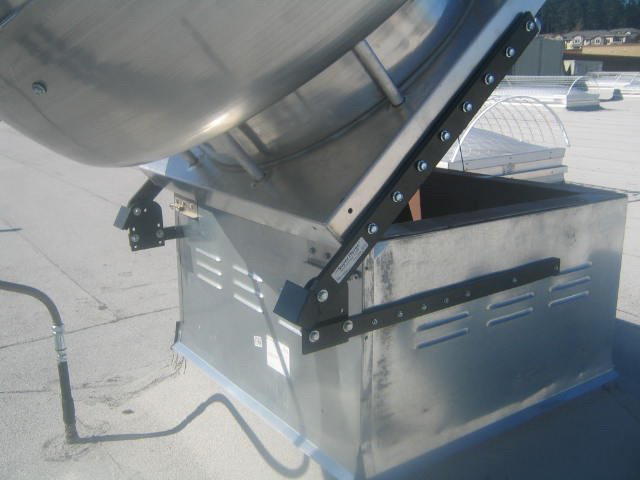 Installing the appropriate grease containment system on/around such fans is a small investment that can save you from costly repairs to your roof later on, and we can help you with this. 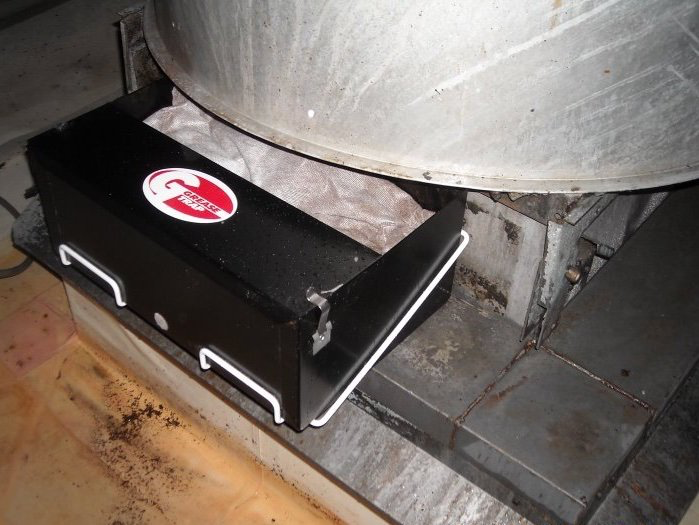 Grease containment systems are versatile and easy to adapt to various exhaust fans, and come in a number of styles. Click on this link for more details. We have partnered with National Fire Fighter Corp. in order to complete your total kitchen fire prevention and protection services package! 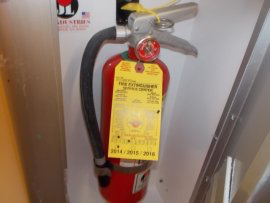 With their team of highly trained and certified technicians, National Fire Fighter is ready to meet all of your fire suppression needs, including routine system & extinguisher inspections, replacement parts, maintenance, and installations. For more information or to request a free quote, email extinguisher@nationalfirefighter.com. If we can’t see it, we can’t clean it! 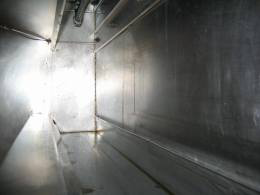 When certain areas of the ductwork are inaccessible, such as at 90-degree turns, the fire code requires access panel openings to be cut into the duct and covered over with removable UL listed access doors that are fire-rated and greasetight. 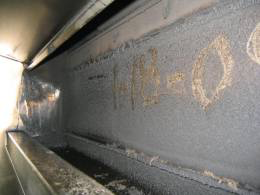 NFPA 96 states that “Openings shall be provided at the sides or at the top of the duct, whichever is more accessible, and at changes of direction.” This is so that every portion of your exhaust system is accessible for cleaning and made fire-safe. 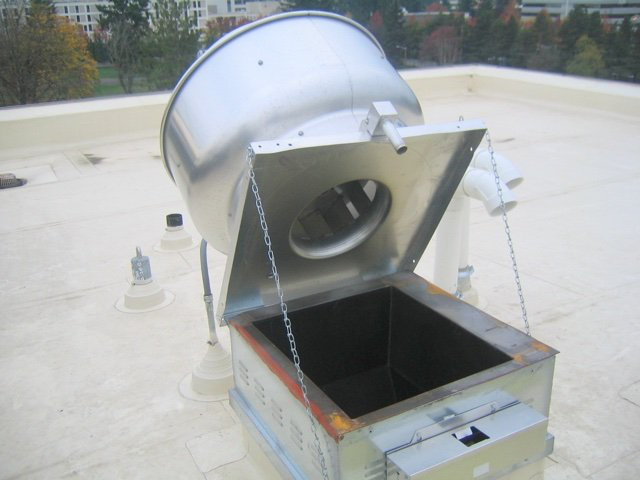 We can help you get these inaccessible areas up to code by way of skillful & qualified HVAC technicians and/or metal fabricators. For more information on access panel doors, click on this link.